You can use jalapeño-flavored process cheese sauce instead of the nacho cheese dip. These tasty morsels are easy to tote. You can take them to your destination before cutting, or go ahead and cut them and arrange on a platter; cover tightly with plastic wrap. Garnish just before serving. 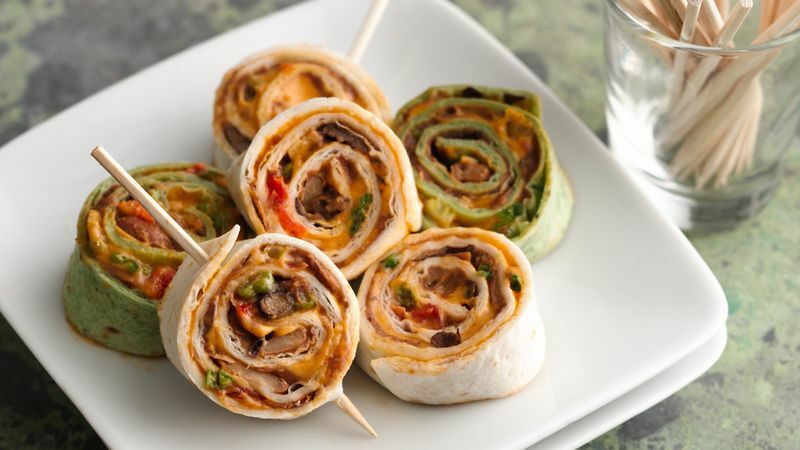 Use two colors of tortillas to make the pinwheels, then arrange them on a holiday platter. Look for tomato-flavored tortillas for a red-orange color. Pierce each pinwheel with a frilly toothpick, and add some fresh cilantro sprigs to the arrangement.